Contact the clerk of court in your county to get a financial form. In many locations you can find them online. Gather the paperwork you will need to refer to while completing your financial declaration, such as a pay stub from your work, copies of all your monthly and annual bills, and a summary of your assets. A tax return is helpful if you do not receive regular paychecks. Enter your personal information, such as address and employment, as requested on the form you are filling out. Enter the docket number for your case. If you do not know the docket number, the clerk of court in your county can give you that information. Calculate your gross annual income by adding all of your income from employment, pensions or retirement accounts, interest income, rental income, business profits, and government benefits, including Social Security and unemployment. The total before any deductions or taxes are taken out is your gross annual income. If you have your tax return from the previous year and your income has not changed, you can use the gross income figure on the tax form. Convert your gross annual income to your gross monthly income, which is the basic figure required on most financial declarations. Simply divide your annual income by 12 to get this figure. Look at your wage or income statement to determine the monthly deductions. If you are paid on a weekly basis, multiply a deduction by 52 then divide by 12 to get the monthly figure. If you are paid on a biweekly basis, multiply the figure by 26 then divide by 12. Do this in each category listed on the form, such as income tax, FICA, insurance, union dues, or retirement contributions. Subtract all of your monthly deductions from your monthly income to calculate your net monthly income. Itemize all of your monthly bills, including rent or mortgage, auto payments, utilities, food, clothing, entertainment, and medical bills. For expenses that are not the same every month, such as medical bills, find the average by adding together a year’s worth of bills and dividing by 12. List all of your installment loan payments, including student loans and credit cards. Many state forms will ask for the balance owed on all loans. Itemize any other debts not payable in installments, such as loans from parents or friends. 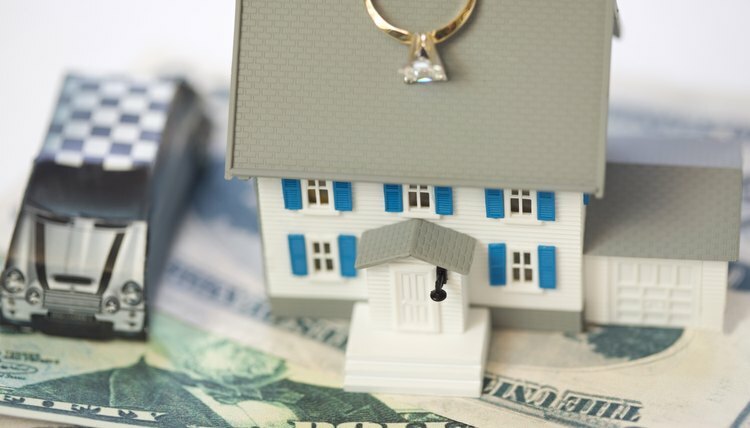 Identify all marital property, which is everything you and your spouse own together, including bank accounts, retirement accounts, pension plans, and real estate. Designate which one of you is in possession of all the marital property, such as automobiles. List property that you or your spouse own that you consider non-marital, such as an inheritance or jewelry you owned before the marriage. State when and how each item was acquired.